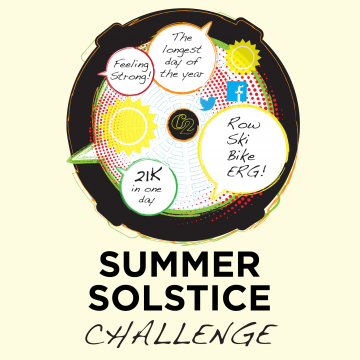 In honor of the longest day of the year, we invite you to participate in the Summer Solstice Challenge. Row, ski or ride 21,000 meters on June 21. Meters can be done all at once in one workout (Set Up a Single Distance Workout) or over several workouts throughout the day. If you add 97 meters to row/ski 21,097 meters, or a half-marathon, it needs to be rowed/skied all at once in order to qualify to be a ranked piece. Indoor rower, SkiErg, BikeErg, on water and on snow meters count. You can combine meters to reach 21,000 meters. Name inclusion on the Summer Solstice Challenge Honor Boards. Option to purchase a Summer Solstice Challenge items from our third-party fulfillment vendor (availability varies by country).